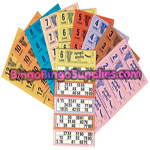 At Bingo Bingo Supplies we stock a wide range of bingo tickets to suit all manner of event or establishment, all at competitive wholesale prices. We can supply everything from single tickets, sometimes referred to as flyers or quickers, to jumbo bingo booklets with up to six or twelve games a booklet. All of our bingo tickets are of the highest quality, with perforations between each booklet and ticket to make them easy to use without damaging them. We can supply our bingo books in a range of different colours, if you have specific requirements feel free to contact us to discuss your options . The third, 30 (or 31) to 40 and so on up until the last column, which contains numbers from 81 to 90. Tickets are sold as strips of six, allowing every number between 1 and 90 to appear across all six tickets. This guarantees that players are can mark off a number every time one is called. Bingo tickets obviously vary in price depending on the type and quantity you are buying, and we offer a wide range of options to suit the needs of everyone. You can purchase jumbo flyers in 6 and 12 to view, booklets full of bingo cards, as well as strips of tickets. We also supply related products such as fundraisers, and these small games can add extra fun to your bingo night or event. To see detailed prices for the bingo tickets we sell please click here or choose one of the popular products below. Here of course! If you have tried to buy bingo goods online before, you will know the real difficulty in finding a reliable, competitively priced supplier of bingo accessories. 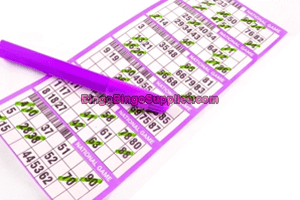 We are dedicated to providing a one stop service for all your bingo needs at affordable prices, and can handle any order large or small. We always stock a large range of bingo tickets, and you can rely on us to help your bingo event run smoothly. We have listed a selection of the most popular bingo tickets we currently offer. 6 to view with perforations between each ticket. One colour per 6,000 tickets. 12 to view with perforations between each ticket. One colour per 12,000 tickets. Available in strips of 6 to view with perforations between each booklet. Manufactured in specific colour combinations with colour names printed on each page.